I hated every minute of training, but I said, “Don’t Quit now and live the rest of your life as a champion. Sometimes, it can be hard to do the things that are going to pay off in the long-term. This quote reminds us that it’s worth pushing through the pain and inconvenience if we want to be a success in the future. I am the Greatest, I said that before I was. Ali’s self belief was legendary, but we need to have a similar level of confidence if we want to make the most of our abilities. What do you want to be and what are you going to start saying to yourself now to bring it to reality? I absolutely love this quote and am determined to make sure that this doesn’t happen to me. Keep reading great books, keep having interesting conversations with intelligent people who don’t always agree with you, keep watching TED talks. Whatever it is that you do, keep learning and keep expanding your mind. Life’s too short to be a hamster on a wheel. If they can make penicillin out of mouldy bread, then they can sure make something out of you. Be encouraged by this statement. Whatever your situation is, even if you’ve lost all hope, remember that you haven’t peaked yet, there’s still time to make an impact and you can still achieve great things with your life. I hope that you found these quotes helpful. Do you have any other favourite Muhammad Ali quotes that you would like to share? Previous post – What’s the Greater Risk? 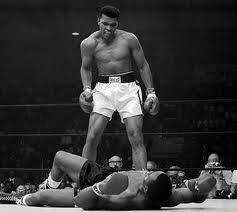 I known Muhammad Ali as a boxer only. Just now that I discover that he has a lot of wonderful and very inspiring quotes. Thanks for sharing. I like how you took the time to find out more about him, to listen to more than just the boasting. I especially like the last one! 🙂 Thank you, Coach D! Thanks Debbie, he certainly is a fascinating and inspirational man. There was so much more that I could have written about him, but I was conscious of room. I love that last quote the best. I am so glad you reminded me of it about the penicillin from moldy bread! The entire time I was reading your wonderful post here, I visualized Ali at the 1996 Summer Olympics in Atlanta going every so slowly, always looking up, up and and up those stairs to light the flame at the opening ceremonies. It was reported there was not a dry eye in that vast stadium–and probably not in a single face of any TV viewer! I was so pleased for Ali that his trainer lived to celebrate Ali’s 70th birthday with him. Thanks Rose, that certainly was a great moment in sport. Thanks Jen, I hadn’t come across the last one either until I had started researching for this post. I remember crying a river when I watched his biopic Ali (2001). Despite his shortcomings, he’s become an inspiration to a lot of people especially to aspiring boxers. Thank you for this post, I loved the last quote. « What’s the Greater Risk?